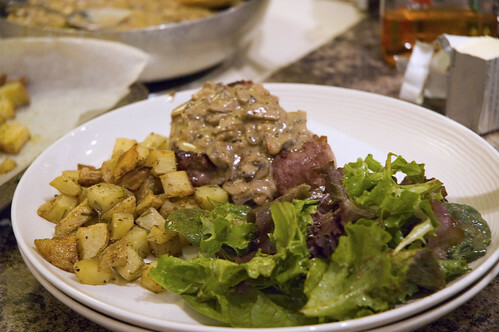 As much as I enjoy displays of scorn and derision toward unadventurous eaters...sometimes what you really need are good old-fashioned steak and potatoes. Friday night was such a night....richness, decadence and good old-fashioned red meat beckoned.....along with red wine, it was simple meal worthy of a feast. As the recommendations of winemadeeasy, I hunted down the 2003 Cathedral Cellar Cabernet Sauvignon. And what a hunt it was - in super-sub-zero temperatures, I trekked well over a kilometre off my bus route to seek out this wine. Totally worth it. I think it might be my new favourite wine to sip and enjoy alongside a hearty meal. 1. Preheat oven to 300F. Line a baking sheet with parchment paper (or a silpat). 2. 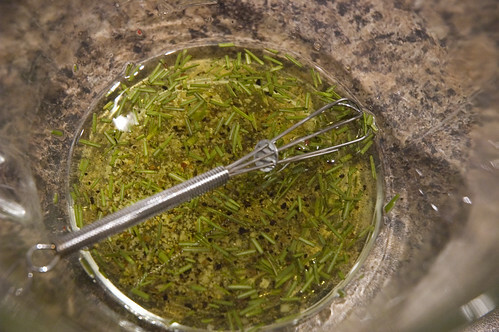 In a large bowl, combine olive oil, salt, rosemary and garlic. 3. 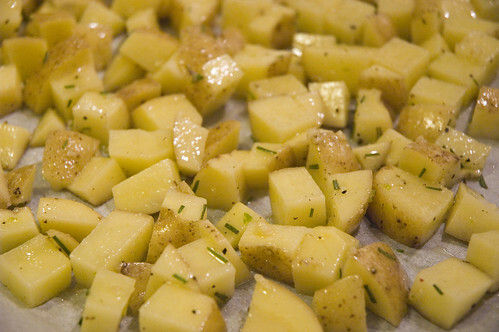 Add potatoes and stir well, making sure potatoes are well-coated. 4. Dump the mixture onto the baking sheet and pop in the oven. 5. Set the timer for 20 minutes, and then turn the potatoes. Set the timer for another 20 minutes. 6. Reduce the temperature to about 175F, add the extra rosemary and another sprinkle of salt and cook a further 30 minutes (the long, slow cooking time is key to getting the perfect texture to these guys - you can cook them at a higher temp, but they won't be as tasty!). 1. In a medium skillet, melt butter over medium heat. Add mushrooms. 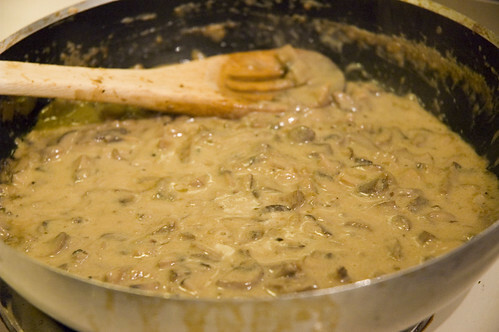 Once the mushrooms start releasing their liquid (about 3-4 minutes), add the chopped shallots and the peppercorns. 2. Once most of the mushroom liquid is gone, add the brandy and boil until most of it has evaporated. 3. Add broth, cream and dijon. Boil the mixture over medium high heat until desired consistency is reached (probably about 15 minutes). Just before serving, stir in the extra butter. Yum. For the steak, we used top sirloin, bbq'ed by a very brave hubby in the deep-freeze-like outdoors, with just montreal steak spice to season. His was cooked to medium, and mine to medium-rare. Served with a green salad with balsamic vinaigrette (1 T balsamic vinegar, sea salt, pepper, 3 T olive oil, 1 T dijon mustard and whisk away). One of the best dinners we've had in a while....simple, decadent and AWESOME with the right bottle of red wine. Thanks for reading! YUM! Looks so good, I will have to try it sometime, especially the potatoes! Hey! Glad to hear that you enjoyed the wine! I agree, it's devine with a good hearty meal. I will have to try your coating for the potatoes. Hubby is drooling over my shoulder as I type this. Happy eating & drinking! I'm trying out a few new wines this weekend. This is getting to be an expensive side-project - lol. Hah, didn't take you long to return to your meat-eating ways! Of course I'm teasing you. That meal looks absolutely delicious and perfect for a cold winter evening. I can imagine how well that wine would have paired. Sometimes I do wish I ate meat just so I could enjoy just pairings, but ahh well. Good. God. I am so making this on vacation. You should have a show. Wow - that mushroom sauce looks absolutely fantastic. I will definitely have to find a vegetarian application for it. pinkmoon - thanks so much for the link! much appreciated! fiber - you could put it over any kind of fish (which I think you eat? ), or even with a pasta, I bet it would be good. Gnocchi perhaps? Oooh, fab. I'm ever in your debt for the mushroom topping recipe. I've looked for a cream sauce involving brandy for ages - one that didn't require me to flambee, that is. The thought of flambeeing in my wee kitchen gives me the heebie jeebies. Looks like a delicious dinner. Oh my! I want to eat this right now! I am making this on the weekend...now if I can just get DH to like mushrooms!